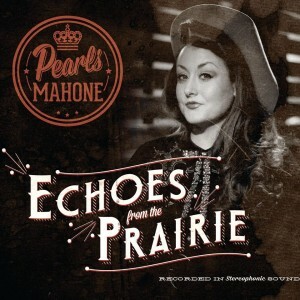 Echoes From The Prairie, the new album from country singer Pearls Mahone is an inviting and bouncy record that brings the country genres old fashioned roots to a new generation. On her website, Pearls claims that she would make country greats such as Johnny Cash, Loretta Lynne, and Patsy Cline proud of her chosen musical style and that couldn’t be more true. Brought up with the music she heard in church, Mahone for the most part abandons any religious ties early on, to make her songs enjoyable to all. Every song on Echoes is a pleasure to hear, and Pearls obvious talent is apparent from the first notes she sings. The records opening tune “Blow Your Top,” is a catchy country tune that introduces us to Pearls and her silky and powerful voice. While Mahone sounds at times like a reincarnated Patsy Cline, she brings her own personality to her songs, making each one truly her own, all while abandoning the trappings of today’s pop saturated country music. “I Had Someone Else” is a light and airy track that pulls us in immediately, as each musician is allowed to show off their skills, while making sure that everything about the track is authentically country, from the instruments, vocals, and the feeling that we are being told a story that we all know. “Old Time Religion” takes us back to Mahone’s roots growing up in church, and while she mentions Jesus in the tune, Mahone doesn’t let her faith define her music, and instead uses it to provide her audience with a window into her past, letting us know a little bit more about her, which only adds to the likability of her songs. One of the albums last tunes is “Go To Sleep Little Baby” an acapella tune that shows off the breadth of Pearls and her vocals. While the tune is only forty-five seconds in length, its simplicity adds a layer to the music that we can’t help but appreciate as we really get to hear Mahone and her vocal ability. While Pearls Mahone is making music for modern times, she sprinkles in a little of the old days, as she makes sure her version of country music pays tribute to some of its greatest stars, while surprising us with her raw talent.